The black ‘78 will be instantly recognizable to any fan of the movie “Smoky and the Bandit.” This kit dates back to 1978, and has recently been reissued again in a new box. I airbrushed the body with Model Master Classic Black, thinned with lacquer thinner, and rubbed out when dry with Wright’s Silver Creme silver polish. 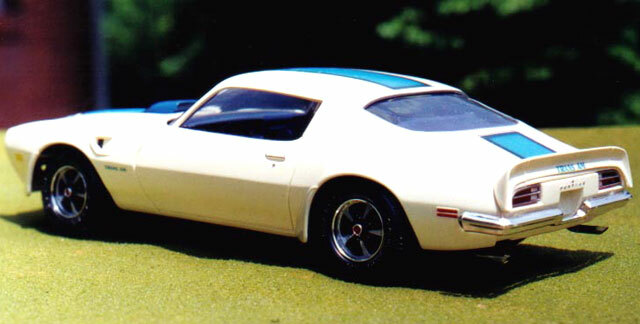 The kit decals were applied directly over the polished paint, as the real car’s “screaming chicken” markings were also a type of big decal, not painted on. The interior is painted Model Master Black Chrome trim. The gold trim was picked out with Testor Gold in the small bottle. The kit decals were used for the stripe, as again these were big vinyl “decals” in real life. One small problem with this kit is trying to match the decal color to paint the “shaker” hood scoop. I used Model Master Ford Engine Blue, which is not a perfect match. I should have mixed up a custom blend, but I was in a hurry to get this model built--I finished it in just seven days, working four to five hours a night on it. The interior is, if I remember correctly, Model Master Blue Angel Blue. Both models have chassis painted in Model Master Black Chrome Trim and engines in Model Master Pontiac Engine Blue. but the Monogram kit goes together just fine!